Professor Philip Alston, United Nations Special Rapporteur on extreme poverty and human rights, made a detailed and impactful statement on his visit to the United Kingdom on Friday 16 November 2018. His statement has garnered a considerable political response, with Prime Minister Theresa May’s spokesperson commenting that “we strongly disagree with the analysis”, and Amber Rudd using her first parliamentary appearance as Work and Pensions Secretary to criticise the tone of the report. However, a spokeswoman for the DWP said that they had no dispute with the statistics used by Alston. Policy in Practice broadly agrees with Alston’s report as an excellent summary of the current situation in the UK. Many of the findings and suggestions made echo our own recently published analysis. 14 million people, a fifth of the population, live in poverty in the UK. 1.5 million of these people are destitute, unable to afford basic essentials. Universal Credit is, at its heart, a good idea. The current benefits system is unduly complicated, and so consolidating six benefits into one makes sense. There have, however, been unnecessary problems with the delivery of Universal Credit, such as the five week delay between claiming and receiving benefits. In addition, the fact that Universal Credit has been rolled out alongside major cuts to welfare spending has resulted in hardships. Some of the recent changes to welfare policy should be welcomed, for example the incentivising of employment. However, these do not take away from the fact that millions of people, often with barriers to work, remain in poverty. Record employment rates do not preclude high levels of poverty; almost 60% of those in poverty are from working households.. The role of Local Authorities is crucial and have seen a rise in demand for their services. Government cuts that have resulted in local governments in England seeing a 49% real-terms reduction in Government funding from 2010-11 to 2017-18 have had a huge impact. The ‘digital-by-default’ nature of Universal Credit is problematic; more support should be offered to those with poor digital literacy. This illustrates the importance of Local Authorities, since they are able to provide this support. The 2018 Autumn budget has introduced some positive changes to Universal Credit, resulting in an estimated 2.4 million households being better off. However, research carried out by Policy in Practice paints a slightly less positive picture: those with disability or illness, and the self-employed, do not benefit form the budget changes. Whilst the Government claims it is aiming to avoid burdening the next generation, many of its policies are indeed having that effect. Alston was clear about the importance of local authorities, calling them a “real social safety net.” Many of the problems cited in the report are being proactively tackled by local authorities we work with. They [local authorities] have expended significant expense and energy to protect people from what is supposed to be a support system. Local authorities play an increasingly important role in providing support and we work with around 90 local authorities who are proactively helping their residents and tackling poverty. Luton Council, for example, has developed a data-led anti-homelessness strategy. By using Policy in Practice’s LIFT Dashboard, Luton is able to proactively identify households at risk of homelessness and target support to them accordingly. They’re not just responding once the problem has arisen. Alston repeatedly warns of the risks of ‘over-digitisation’. The digital by default nature of Universal Credit presents a barrier to many claimants, especially poorer and more vulnerable ones. The help frontline staff gives to claimants to navigate the application system is crucial. In our recent work for supported housing clients we interviewed some residents who are Universal Credit service users, as well as supported housing staff and JobCentre Plus work coaches. We found that only a third of interviewees managed to complete the digital claim process without support, and interviewees with learning difficulties or mental health difficulties found the process especially difficult. It is clear that cuts to local authorities will have long last effects. Local authorities without funding can’t act proactively, like Luton, or staff libraries with digital support workers. The many billions advertised as having been extracted from the benefits system since 2010 have been offset by the additional resources required to fund emergency services by families and the community, by local government, by doctors and hospital accident and emergency centres, and even by the evershrinking and under-funded police force. The rollout of Universal Credit, and the impact it is having on poverty in the UK, was a central component of Alston’s statement. Alston clearly separated out Universal Credit as a concept and how it has been delivered. However, when critically assessing Universal Credit, it’s more helpful to group criticisms into three areas: those relating to Universal credit as a concept, those relating to its delivery, such as the five week delay between claiming and receiving Universal Credit, and those relating to other government policies brought about alongside Universal Credit like cuts to welfare spending. We recently wrote to Frank Field MP, Chair of the Work and Pensions Select Committee, with suggestions on how to improve the delivery of Universal Credit. We suggested that the DWP should improve partnership working with support organisations, develop a more flexible approach to payment options and provide greater support to both make a claim and manage a claim. We also highlighted the need for the DWP to invest in specialist trained staff to answer complex telephone queries and to deal with vulnerable claimants sensitively and knowledgeably. We outlined how the Policy in Practice Benefit and Budgeting Calculator is used by support organisations to show people likely changes in their income, possible ways to maximise income and review their budgeting. The tool helps advisors have objective, supportive conversations with people on low incomes, giving them information they can use to make their own decisions in moving towards financial security. Alston’s statement picked up on the impact of the recent Autumn budget changes, a topic on which Policy in Practice has already published a report. Like Alston, Policy in Practice welcomes the extra £1.7 billion put aside for benefit support under Universal Credit, and the additional £1 billion to assist the transition for households migrating to Universal Credit. Furthermore, we’re pleased about the changes to the delivery of Universal Credit, namely the run-on of Jobseeker’s Allowance, Employment and Support Allowance and Income Support, which will reduce the initial waiting time from five to three weeks. Whilst Alston acknowledged that the majority of those in poverty come from working households, he did not look at this in light of the budget. Our post-Budget analysis found that employed households on Universal Credit gain £18.41 per week from the budget and will, on average, be £9.13 per week better off compared to under legacy benefit. However, the budget has not had a uniformly positive impact. Income for households with a person who is ill or disabled will be similar, post-budget; these households will still be an average of £28.76 per week worse off under Universal Credit. Furthermore, self-employed households hit by the minimum income floor will be a further £2.42 per week worse off as a result of the Budget, since the the increase in the National Living Wage from April 2019 results in a higher assumed income being used in the assessment of support for self-employed households, and so correspondingly lower benefit support. This loss is higher than any gains in support as a result of increased work allowances under Universal Credit compared to legacy benefits. Read the evidence we recently gave to the London Assembly on self-employed people and Universal Credit here. Many of the changes announced in the budget will not take place immediately, reducing their positive impact. Whilst Alston picks up on the reduction in the credit payment cap from 40% to 30%, and the reduction in the delay between application and receipt from five to three weeks. he doesn’t mention that these changes will not happen until October 2019 and July 2020 respectively. We agree with the recent Trussell Trust statement that these delays are unnecessary and that people will continue to suffer in the meantime. Alston identifies child poverty as an important and growing problem, citing the negative effects of the benefit changes introduced in April 2017 which limited benefit support to only two children. Using a Policy in Practice LIFT Dashboard, Camden Council identifies and tracks low-income households with children, pinpointing households that are or could be eligible for free childcare. Our recent analysis shows that child poverty is likely to persist, especially since the transitional arrangements put in place for families with three or more children, will end once managed migration onto Universal Credit begins. Even after the Autumn Budget changes, 76% of households with more than two children will still be worse off under Universal Credit, losing an average of just under £50 per week. Millions of families will make a Universal Credit claim in the coming months, many of whom will turn to local authorities for support for the first time. We work with councils to show the cumulative impacts of welfare reforms on people and help target personalised support. Local authorities are set to lose vital administrative data on vulnerable low-income families, currently collected via Housing Benefit. As Universal Credit rolls out, this information will disappear, drastically limiting councils’ ability to support people. There is no current arrangement between DWP and councils to systematically share similar administrative data available through Universal Credit. Boost financial resilience. 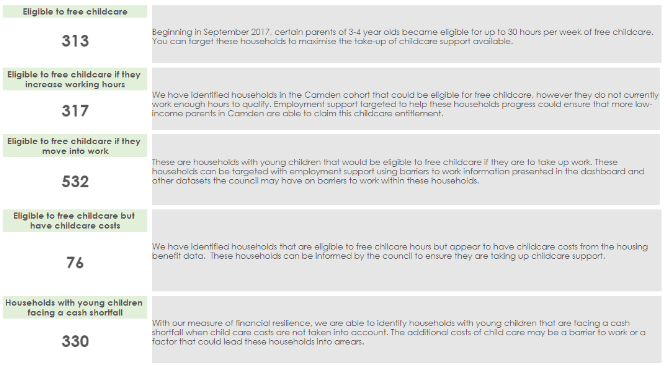 Councils use admin data to support families who are subject to the Benefit Cap into work. Capped households in London are 21% more likely to move into work, mainly due to the efforts of council support teams. These gains could be lost. Reduce the risk of homelessness. Public bodies have a statutory duty to refer households at risk of homelessness. Councils use their admin data to identify families at risk and track the effectiveness of interventions. This will no longer be possible. Not replacing the adminstrative data available from Housing Benefit with Universal Credit is a huge mistake. Not only will this undermine local authorities’ ability to fulfil their statutory duties but it may also result in higher costs to the public in the form of increased demand for temporary accommodation, increased levels of indebtedness and a less effective use of public resources. We call on the Government and Parliament to urgently consider how to share Universal Credit data between the DWP and local councils across the UK. Please join us.